Are they a Chamber member? Click here to see. Grow your network and enter to WIN! Do you know a business that could benefit from a Chamber membership? When you refer a business who joins the Saginaw County Chamber between April 1 and December 29th you could win prizes including a $250 Visa gift card. Any business or non-profit organization not listed in the Saginaw County Chamber of Commerce Membership Directory is fair game! A Chamber staff person will be responsible for collecting the application and payment and will notify you when the application process is complete. New Member applicant MUST specify your name and business on the “Referred By” line on the application for it to count towards your total. 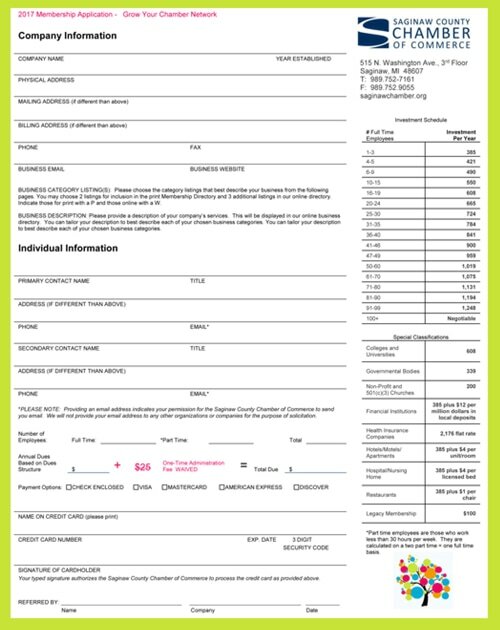 The Chamber office must receive the new member’s completed application and paid membership investment by May 15th for it to count towards your total. Postmarked applications and payment of May 15th, or before, will be counted towards your total. Winners will be drawn at the June Percolator Breakfast and New Member Expo held on Thursday, June 1st, at Horizons Conference Center. Contact only people you know. Build on the relationships you already have. There is no list of people to call. Check the online Membership Directory to be sure they aren't a member. Give your personal testimony (why are you a member.) The most successful members use their own resources. 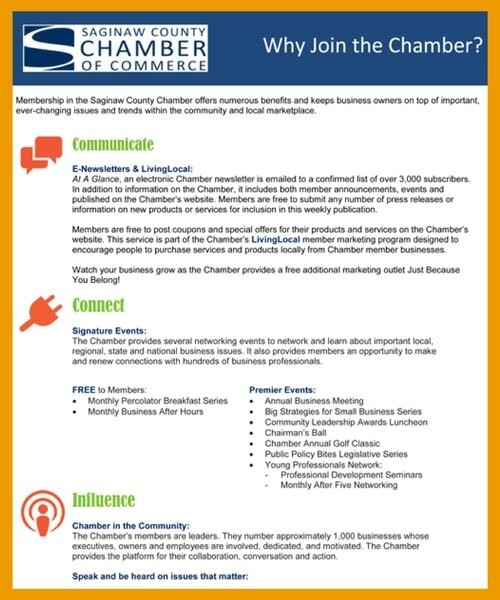 Introduce them to Susan Moody via phone at 989-757-2112, by email at Susan@Saginawchamber.org or direct them to the Join the Chamber page on the Chamber website for more information. If two or more referred businesses submit a completed member application with payment, the referring member will get an entry into a drawing for a $250 Visa Gift Card and entry into the general drawing. Multiple prizes will be given away in the general drawing. If one referred business submits a completed member application with payment, the referring member will get an entry into the general drawing. Multiple prizes will be given away in the general drawing. 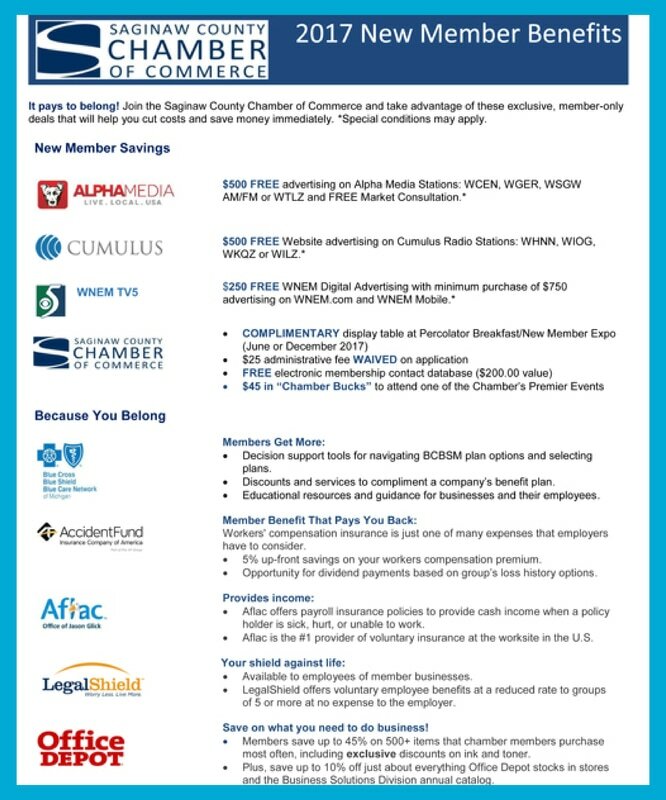 COMPLIMENTARY display table at the Percolator Breakfast/New Member Expo (June 1st or December 7th) and listing in the New Member Addendum. $25 administrative fee WAIVED on application. $45 in “Chamber Bucks” to attend one of the Chamber’s Premier Events. A 2017 Membership Certificate and window cling. A welcome in the Chambers weekly e-newsletter the At A Glance viewed by over 3,000 individuals. 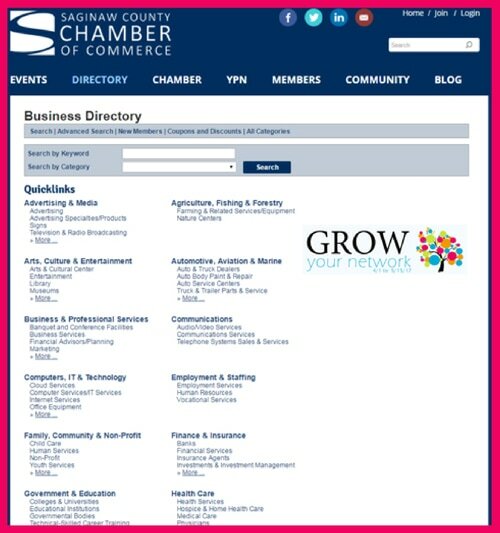 A listing on the home page of the Chamber’s website for two months with a direct link to your page in the Chamber’s online membership directory.